Our gibbon Peppy, who celebrated his 35th birthday yesterday, was born at a cancer lab at the University of California at Davis in 1979. The laboratory used gibbons in painful and usually fatal viral cancer experiments. Fortunately, our Peppy is happy and healthy to this day. But Peppy was “The Gibbon Who Got Away.” The virus they gave him didn’t make him sick. 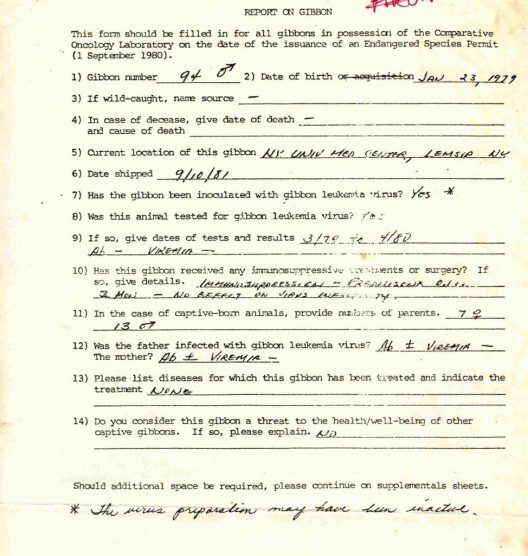 This document from the former UC Davis cancer lab shows that Peppy had been inoculated with a gibbon leukemia virus but tested negative. The California laboratory got most of its gibbons shipped from Thailand, many of them via illegal means: officially, Thailand had actually banned all gibbon exports. One particularly gruesome shipment reached the lab on January 16, 1974. It consisted of ten un-weaned baby gibbons exported by the Thai dealer Pimjai. On arrival, one infant was dead and the rest had pneumonia. Five more died, and the survivors were inoculated with a gibbon leukemia virus and presumably died, too. IPPL was able to get shipping documents from a supportive Thai government official. Our protests led to the firing of two corrupt customs officials in Thailand. In addition, IPPL fought to get the permitting requirement of the U.S. Endangered Species Act enforced with respect to this laboratory. 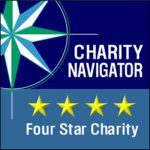 We filed a notice that we intended to sue with the U.S. Fish and Wildlife Service. As a result, the lab filed a permit application–and was awarded a permit to kill 10 young gibbons per year. The USFWS justified issuance of the permit by saying that the lab was involved in “conservation” as, if the lab were not permitted to kill gibbons, it would not breed gibbons. Unfortunately, at around that time, the U.S. National Cancer Institute was trying to procure gibbons for experiments in multiple venues. The NCI tried and failed to set up labs in Thailand and Indonesia, but an animal-friendly senior official at the U.S. Embassy in Bangkok kept tipping us off about the attempts of U.S. scientists to get more gibbons. We would pass on that information to our wonderful pro-gibbon contacts in the Thai wildlife department, who would make a special point of putting a stop to these U.S. efforts. The NCI also tried to set up labs in Malaysia through a contract with Cambridge University, England. However, IPPL obtained documents about the plans for field studies and the establishment of primate labs through the U.S. Freedom of Information Act and informed our friends in Malaysia’s wildlife department, who did not know where the money was coming from to set up these facilities; we were happy to provide them with that information.  Peppy is just one gibbon out of hundreds who was saved thanks to IPPL’s work over the years. The UC Davis lab was eventually closed down, in part because the type of cancer they were inducing in gibbons had never been found in humans (a shame that they didn’t make a point of checking this out beforehand). Peppy and his companion Helen were sent to the Laboratory for Experimental Medicine and Surgery in Primates (LEMSIP) in New York, which later donated them to IPPL. 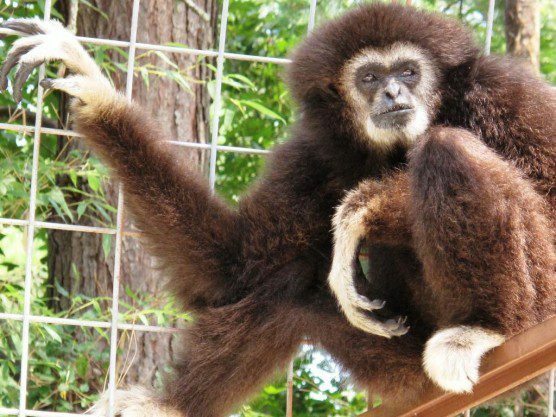 Only a very few gibbons remained in U.S. labs after IPPL received Helen and Peppy, Igor, Shanti, Blackie and Penny with their daughter E.T., Louie-Louie, and Arun Rangsi. 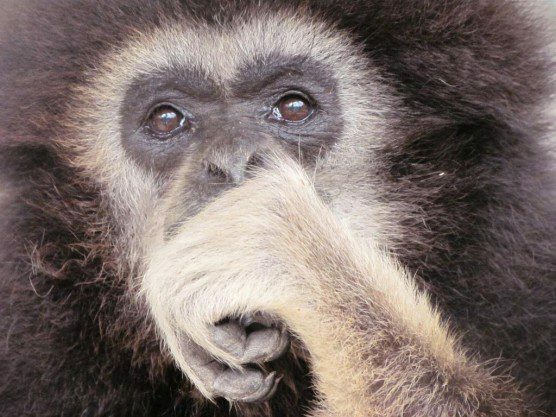 Now the number of gibbons in our labs has dwindled to zero–fortunately.